Nanomaterials for Green Energy focuses on the synthesis, characterization and application of novel nanomaterials in the fields of green science and technology. 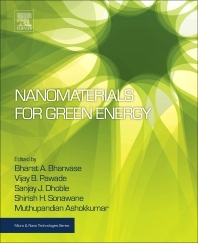 This book contains fundamental information about the properties of novel nanomaterials and their application in green energy. In particular, synthesis and characterization of novel nanomaterials, their application in solar and fuel cells and batteries, and nanomaterials for a low-toxicity environment are discussed. It will provide an important reference resource for researchers in materials science and renewable energy who wish to learn more about how nanomaterials are used to create cheaper, more efficient green energy products. The book is very excellent, it is addressing and solving the challenges that we are having currently in the whole world especially the topics likes Nanomaterials and Its Application for Clean Environment, Empowering the Future With Organic Solar Cell Devices Graphene-Based Materials for Clean Energy Applications, Advanced Nanomaterials for Green Energy: Current Status and Future Perspectives and White Light-Emitting Novel Nanophosphors for LED Applications. It is even show you in which new direction is research moving. The book is written in very good and simple English. I’m going to make sure that I have it on our library shelf and even in my office. This book covered all content related to properties and application of Nanomaterials in energy conversion and storage devices. Really helpful for researchers. Bharat A. Bhanvase is Associate Professor of Chemical Engineering , Laxminarayan Institute of Technology, Rashtrasant Tukadoji Maharaj Nagpur University,India. His research focuses on wastewater treatment, cavitation-based nanomaterials and nanocomposites, process intensification, microfluidics and nanofluids. Dr. Vijay B. Pawade, is an assistant professor in the Department of Applied Physics at Laximarayan Institute of Technology, R.T.M. Nagpur University, Nagpur, India. His research is focused on rare earth doped oxide materials and their applications in LEDs and solar cell devices. He has published 27 research papers in refereed international journals and has served as a reviewer of many peer-reviewed journals published by Elsevier, Springer, Willey, Taylor fancies, RSC, ACS. Sanjay J. Dhoble is Professor of Physics in Rashtrasant Tukadoji Maharaj Nagpur University, India. His research focuses on the synthesis and characterization of solid state lighting nanomaterials as well as development of radiation dosimetry phosphors using thermoluminescence, mechanoluminescence and lyoluminescence techniques. Shirish H. Sonawane is Associate Professor at the Chemical Engineering Department, National Institute of Technology, India. His research Interests focus on the synthesis of hybrid nanomaterials, and cavitation-based inorganic particle synthesis. Muthupandian Ashokkumar is Professor of Chemistry, University of Melbourne, Australia. His research focuses on the ultrasonic synthesis of functional nano- and biomaterials that can be used in energy production, environmental remediation and diagnostic and therapeutic medicine.